Post office Change of Address USPS Form 3575 temporary and permanent Change of Address online. Select Individual if only one person is moving. Select Family if everyone in the household has the same last name and all members of the family are moving. Select Business if a Business is moving and you are an authorized representative of said Business. Contact our customer support by clicking here or call us at (707) 948-6245. Our knowledgeable representatives are available to assist you from 9AM to 6PM (EST). If for any reason you are not satisfied with the service provided, simply email us or click the cancel order link on our contact us page. Your order will be refunded and your address change will be cancelled. Please note: E-Debit online check payments can not be refunded. All payments made to Address Change LLC. Address Change is a third party agent that prepares and facilitates the address change filing process. We strive to making moving easier and streamlined for our customers. We work for you, not the government. Address Change is NOT affiliated with The United States Postal Service (USPS or Change Address USPS), The Internal Revenue Service (IRS), The DMV, or any other government agency. There is a small one time online change of address form processing fee of twenty dollars. You can obtain a change of address FREE by visiting your local office, but why wait in line and file with multiple agencies. We will help you update everything from one online application making this a simple and painless experience. Save time and money by utilizing our services. Address Change acts as an authorized agent for those looking to file their address change request with the United States Postal Service, DMV and other agencies. The accuracy of the information is the responsibility of the user. This service does not guarantee that any of the offices notified will process your address change. We simply prepare the required forms and provide the instructions needed. 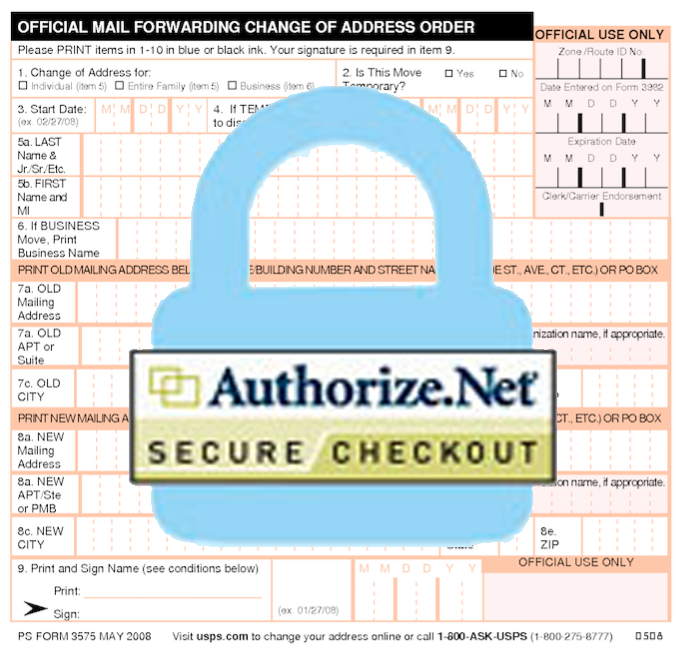 Please note that your access to and use of www.change-of-address-online.com is subject to additional terms and conditions. Please allow up to 7-10 days for completion. United States Postal Service, USPS, Postal Service, Post Office and ZIP Code are all trademarks of the United States Postal Service and only used on this site to refer to the services offered by the United States Postal Service such as Change Address USPS online. We are not affiliated with any government agency. U.S. Postal Service Change of Address online form processing and us post office change of address.